Sit back, carve out a little time and enjoy our collection of baby products WordPress themes we have put together for you. Baby products shops and baby stores, kids and kids development centers, baby diapers and child care product owners, play schools and kindergartens, kids zones and kids clothing distributors, kids fashion boutiques and stores, kids planet and room builders and designers, baby toy stores and toddler care medical centers, babysitting agencies and other businesses can use any of these child centric and baby products WordPress themes. Having an online platform for selling products and offering services has never been as important as now. The modern digital arena that has already managed to create certain client behavior and consumer culture online, manipulates the way people react to your business, evaluate it or give preference to it. Therefore, ensuring your place in that digital realm and being closer to the target audience is what you need to take as a priority if you are dealing with any e commerce based business and not only. Go for building an eye catchy and dynamic e commerce website with any of these baby products WordPress themes and you will benefit a lot. Affordable pricing, well support from the theme’s authors’ side, full documentation as a bonus, completely customizable nature and many other advantages are waiting for you with these premium WP website building ecosystems. Start with any of these award winning baby products WordPress themes and take it to another level of visual excellence and functional capacity without having to do with a barrage of complex processes or web coding. Everything is already well done in terms of coding to keep you away from it so that you can spend your time on a more productive and creative work. Depending on your specific or corporate needs, Toy Store can be transformed and restructured into anything with ultimate color and font choices, gallery and image management tools, homepage slider for attractive offers and special discounts, widget ready areas with useful links, social media profiles and contact details. As for the organization of an online storefront, you will have unlimited options to do that whenever you add one of the practical e commerce systems to Toy Store. Along with commercial plugins, other important ones are also compatible with toy store to enable multilingual content or online payment transactions. Babysitter is clear and fresh looking theme following supreme standards of the modern virtual arena and meeting the requirements of its users. What makes Babysitter one of the most preferred baby products WordPress themes is the way it approaches to management and customization. There is hardly any look or functional base you cannot achieve with this completely editable and extensible website builder that is also armed with shortcodes and other essential elements ready to ensure the ongoing performance and authenticity of your site. Showcase the profiles of experienced and trustworthy full time and part time babysitters, their services and images, offer baby care products, clothing and toys for online purchases or organize child centric events and celebrations through your website with Babysitter. Maximizing baby products sales and bringing new flows of clients from different parts of the world is totally achievable with Flower Shop. Of course, the decision makers are parents or grandparents or other adults and not babies or children who are instantly fascinated with vivid images and touches. 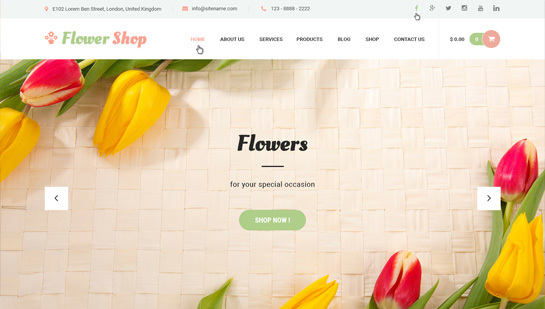 However, Flower Shop guarantees lively atmosphere with tons of color choices to turn your website into a colorful and attractive place for the website guests to enjoy greatly. From running a daily blog area and sharing useful tips on how to choose baby products to building an e commerce framework for product listings and descriptions, Flower Shop is custom built to assist you in everything. Another useful template that can be geared towards pet and animal care on the one hand, and baby care and baby product marketing on the other, is called Pet Care. Chances are great that you would like to make certain changes to stand out from the crowd and make everything to be in harmony with your thematic content. With Pet Care, there are no obstacles in your way to the theme customization and modification for those purposes. There are also font and button choices, full color changing capacity, layout options, quick loading homepage with prebuilt sections like home, services and contact, sidebar location choices, pre enabled shortcodes pack for quick updates, as well as plugin compatibility shared by Pet Care for the website’s better exposure and operation. Adventure is a profitable and lead generating, ambitious and motivational product you can find among baby focused and baby products WordPress themes. Reach thousands of parents and parents to be with your website powered by Adventure and provide them with an avalanche of offers and products they have been looking for. They are never afraid of spending their time on finding what works the best for their children. Therefore, you’d better put the whole potential of Adventure into action with high quality content, frequent updates, legible typography, social media integration and search engine optimization to win the attention of as many moms and dads as possible. Play School has been developed and styled with all kinds of baby and child focused businesses in the theme authors’ mind. They have worked hard on crafting a serious template that will be flexible and versatile enough to contribute to the promotion of any niche specific website, from school and kindergarten, college or education to baby sitting and baby proofing, child clothing and toys, baby room designer and baby furniture, custom dresses for parties, play and game zones, etc. The theme is also 100% responsive to adapt to the user’s phone requirements or screen size, as well as live customizer based for spending minimal time on the theme management with live preview options. This entry was posted in wordpress themes on March 18, 2019 by SKT Posts Themes.